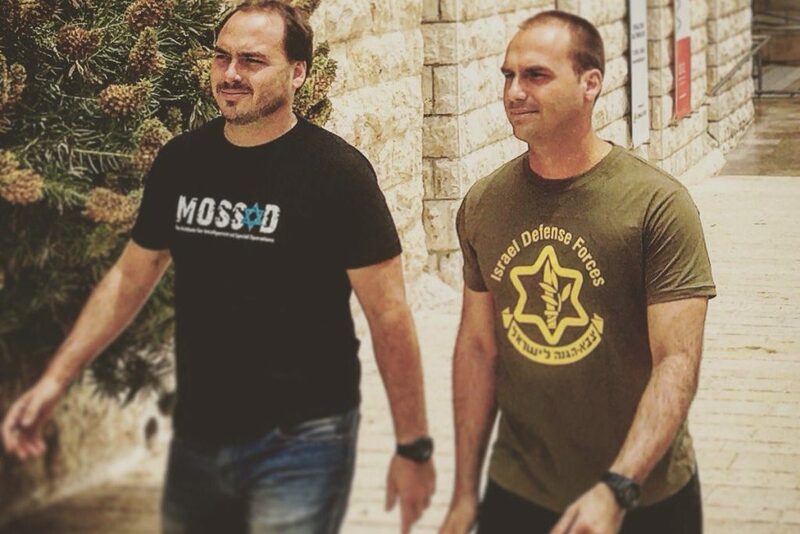 Militaristic machismo: Jair Bolsonaro’s two sons, Eduardo and Carlos, during their trip to Israel in May 2016. Eduardo, right, posted to social media this photo of himself and his brother sporting Israel army and Mossad T-shirts. Last week the Brazilian Foreign Ministry confirmed that it had rescinded the invitations sent to Cuban president Miguel Diaz-Canel and his Venezuelan counterpart, Nicolas Maduro, to attend the inauguration of President-elect Bolsonaro. On Monday, the Venezuelan Foreign Ministry released the letter sent from the Brazilian Foreign Ministry in which the invitation to Maduro was withdrawn because, in the words of the Brazilians, the Venezuelan president “is the epitome of intolerance and fascism.” Caracas replied by saying that in any case Maduro had had no intention of taking part in the ceremony. For his part, Netanyahu has been going out of the way to embrace leaders who, although some insist they are just “conservative nationalists,” are in fact neo-fascists. Among others are politicians such as Hungary’s prime minister Viktor Orbán, who has introduced what he calls an “illiberal democracy”; the Austrian chancellor, Sebastian Kurz, who heads a coalition including a party whose first two leaders were former SS officers; the Philippine president Rodrigo Duterte, who supports extra-judicial killing of Communists activists; and the new president of Brazil, Bolsonaro, who opposes just about everything on the progressive and anti-imperialist agenda.